...A visiting U.S. teacher introduced football at a local high school in the late 1960s, and the game quickly overtook rugby as the island's favorite sport. Football, founded on hitting and shoving, won respect in a culture that honors its most physically dominant men by naming them village chiefs. Schools stake their reputations on football; players earn cachet for being good at it. Forty-one players of Samoan descent are listed on National Football League rosters, and three players from American Samoa were selected in this year's NFL draft. Over the last five years, about 15 percent of the boys who graduated from high school in American Samoa left the island to play college or junior college football in the United States. That "visiting U.S. teacher" was my father, whose visit was a six-year teaching/administrative stint (over a seven-year period from 1963-1970) for the LDS-run high school, Mapusaga. My mother wrote the following recollection after Sports Illustrated published an article about football in Polynesia and how it started in American Samoa. In 1963, Vaughn T. Hawkes was hired by The Church of Jesus Christ of Latter-day Saints to teach math and chemistry at its Mapusaga High School in American Samoa. Upon his arrival, Mr. Hawkes noted a swampy, rocky area adjacent to the school, which held potential as a playing field. He fashioned a crude land leveler out of a rusting truck bed left behind when the military departed from Tutuila Island following World War II. He hooked the leveler on the back of the school tractor, and leveled and drained the field. He then organized the students to gather the rocks into wheelbarrows and haul them off of the field. The grass then grew and the students enjoyed fun and games on the field. One of the games they played was tackle football, without the benefit of pads. The uniforms were shorts and numbered shirts the students bought at a store in Fagatogo. Most of the shirts had the same number. The one game played against students beyond the student body of the school was with Samoana High School, the government school located in Utulei. This game was called the "Kava Bowl." To put it mildly, it was war! In August, 1967, Mr. Hawkes was promoted to principal of MHS. Shortly thereafter, he was contacted by Harvey L. Taylor, then Church Commissioner of Education for the Church. Mapusaga High boys in the early 1960s. 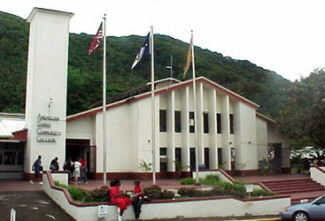 American Samoa Community College today. Taylor offered Mapusaga High School the blue and white football uniforms from the recently closed Brigham Young High in Provo, Utah. The uniforms were accepted and shipped, and the playing field was marked off as a football field. 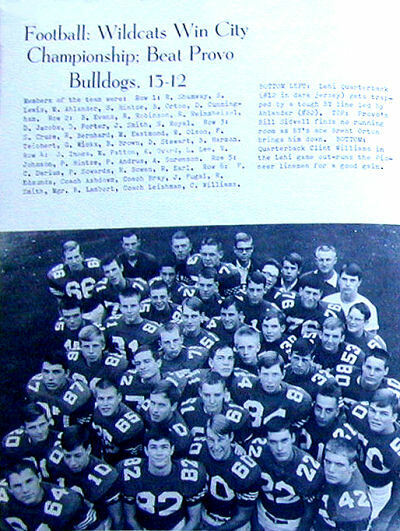 Mr. Hawkes then hired William (Bill) Cravens, a former University of Utah All-American football player who was a resident of American Samoa, to teach football at Mapusaga High School. The students took to football like ducks to water, and played among themselves for a while, but soon felt they needed more competition. Samoana High School was then contacted and encouraged to obtain uniforms for a team. A new high school was also created on the west end of the island at Leone and they also formed a team. The three teams were soon playing each other. The government then constructed an athletic field on the fill dredged from the upper reaches of Pago Pago harbor, and from there the sport began to spread throughout Samoa and the rest of Polynesia. 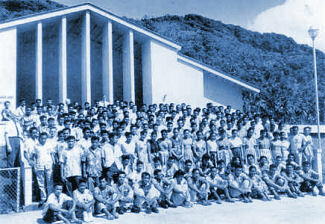 In concert with the completion of the football field at Mapusaga High School and the shipment of the uniforms, a six-channel educational television system was instituted in American Samoa, which beamed educational programs daily to the remote village schoolhouses throughout American Samoa. Mr. Hawkes, who was an amateur radio operator, made radio contact with another amateur radio operator, the vice president of NBC Sports, Carl Lindeman. In their conversations, the endeavors at football in Samoa were discussed as well as the fact that Mrs. Hawkes had attended high school in Rigby, Idaho, with Larry Wilson, who was then an all-pro defensive back (with both wrists in casts) for the St. Louis Cardinals. Mr. Lindeman offered to send a set of tapes of a professional football game in the hope Mr. Hawkes could get the local station to air the game in the evening during the station's entertainment time. Permission was obtained from appropriate NFL officials and the Samoan educational television officials and Mr. Lindeman sent the tape. 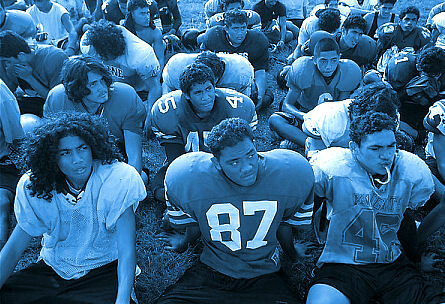 The same tape was shown over and over again each evening, and the Samoan young men and their families learned the game of football sitting in their remote open-sided schoolhouses watching Larry Wilson and the St. Louis Cardinals play the game. The school building in each village was normally the only building in the village that had electricity. Thus, football replaced rugby as the contact sport of choice. Samoan high school football players today.